In a world where every superhero gets a movie, or a movie franchise, it’s hard not to feel a little bit jaded or at least completely overwhelmed by the flood of choices. It seems like there are new movies every week. 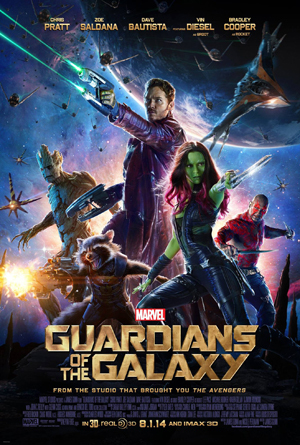 So when a movie like “Guardians of the Galaxy” shows up, it’s hard not to be totally skeptical. For one thing: ANOTHER movie from the endless reservoir of Marvel characters. And another: a giant tree man and a talking raccoon make up part of this team. But all that concern falls away when you watch the movie. Good news: this movie is enjoyable! It’s funny, it’s clever, it’s not a lot of things it could have been. Here’s the premise: Peter Quill is an Earthling who was taken from his home in 1988 and has been raised by a race of blue-skinned thieves. In a tussle to claim a mysterious orb, he and his opponent are arrested and taken to a space prison. Here he meets a giant tree man named Groot, a brilliant but bad-tempered name Rocket, and Drax, a big meaty very literal guy. This motley crew, along with Gamora, the one who fought Quill for the orb, they form an alliance when they discover they have a common enemy in Ronin, who seeks the orb. “Guardians of the Galaxy” is peppered with funny one-liners, top-shelf cast, and plenty of action and special effects to keep viewers entertained. There is a great deal of fighting and killing but none of it is graphic or bloody. Good exciting movie for grown-ups and older children. And I bet you anything you will have “Hooked on a Feeling” in your head for days afterward.